The beep test, also sometimes referred to as the ‘bleep test’, has a variety of names. Most formally it is known as the ‘multi stage fitness test’, but also goes under the title of the ‘Leger test’, ‘pacer test’ and ‘20m shuttle run test’. Whatever the name, the test is a standardised assessment of a person’s fitness levels. It is an extremely simple but powerful test that allows you to estimate your VO2 capacity and benchmark yourself against the fitness requirements for your sport. In short, it’s a great tool for working out if your fitness levels are up to scratch. Whether you’re trying to join the police, the army, or just want to work out if you’re fit enough to play a team sport, such as 5-a-side, the beep test is something that you can use, and in many cases it’s required of you. The great news is that the bleep test gives you an objective measurement to work out if your fitness is up to the level you need. And it’s brilliantly simple – you don’t need any fancy equipment. 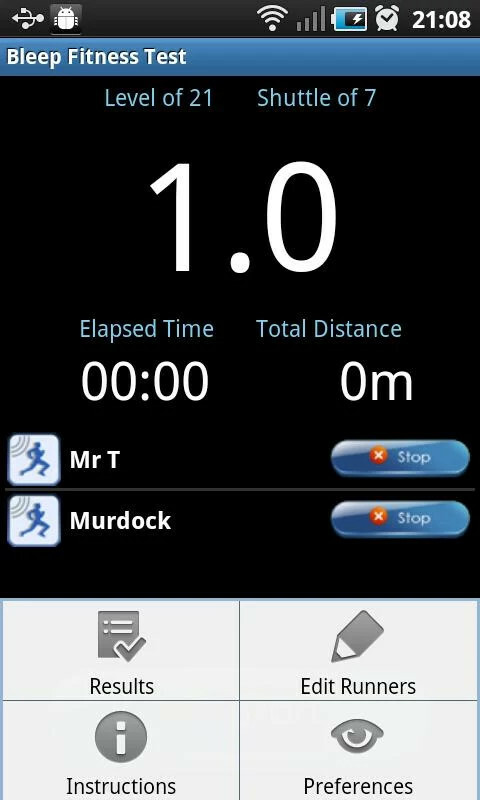 If you’re simply able to mark out a 20m distance, download an mp3 or use a handy app on your phone, then within 15 minutes you’ll know how you measure up. The beep test was created by Luc Leger of the University of Montreal way back in 1983, as a simple running test designed to test a person’s fitness levels. Over 30 years later it’s still in popular use because it remains a great way to measure a person’s all-important VO2 max levels. VO2 max is simply your maximum oxygen uptake, or your maximal aerobic capacity. It’s a scientific measure of how fit you are and is important in determining your endurance capacity in exercise where you’re not flat-out sprinting all the time, which of course lends it well to a sport like 5-a-side. To measure your VO2 with precision, you’d need to be hooked up to a treadmill under clinical conditions and wear a mask which could accurately monitor how much oxygen you were using. However, most people aren’t going to have a facility like that handy and it’s not advisable to spend hours trying to build a crude testing machine from bits and pieces from your local DIY store. Instead, the best alternative is to use the beep test which makes testing VO2 levels something anyone can do simply and easily. Having done the test, working out your estimated VO2 max is simply a matter of applying an equation to the level you get on the bleep test. So what does the beep test involve? Simply, the test involves running back and forth between two points 20m apart. Each run must be synchronised with a pre-recorded audio track which plays beeps (hence the name ‘beep test’) at regular intervals. Over the course of the test, the athlete progresses up through various levels (lasting just over a minute each), with the beeps getting faster at each new level reached. At the point where the athlete fails to reach the line before the beep, this becomes their highest score and the test is over. The great thing about the beep test is it won’t take you long at all. The vast majority of people will be done before they reach level 13, which takes less than 14 minutes. If you made it to this stage you’d have run just over 2.5 km, which is equivalent to 1.6 miles. If you made it to the end of the test, something almost completely unheard of, you’d have made it through 21 levels, running nearly 5 km in a shade over 22 minutes, and you should probably stop reading this blog and instead go and enrol yourself for the Olympics, your result would be that good! Mere mortals, however, aren’t going to need to worry about this, as they’ll be running on empty somewhere between levels 8 and 12. Markers and measuring tape to set up a 20m distance (or use a local athletic track where it’s already marked out). For guaranteed accuracy (and to save shuffling along your 5m tape measure each time), consider buying a long enough tape measure like this 30m one from Amazon* if you’re intending to do this regularly. It’s so important to measure the distance accurately – just 1m less distance can give results 10%-20% better, so make sure you haven’t cheated your way to success. Audio recording – You can get the mp3 file from Amazon* for a modest fee, but you should find on your phone a large number of free apps that will do the job instead. 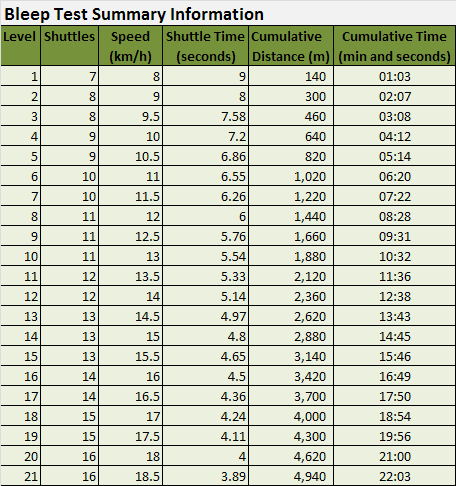 We used one called Bleep Fitness Test on Android – completely free and worked a treat, but feel free to try any out, just make sure that it’s a 20m test and calibrates in line with the table above (i.e. level 1 has 7 stages and takes 1:03 to complete) or you’re doing the wrong test! Comfortable sports shoes and clothing – make sure that your shoes are comfortable and have enough grip. An even surface with no obstructions. An athletics track is ideal because it saves you messing about marking out 20m lines. But anywhere will do, indoors, on grass, on concrete, as long as it’s flat and you have enough grip to turn without risking injury. If you’re doing this test for entry to the army, police or another organisation, you’ll be told what level you need to achieve. But here on this site we’re interested in how fit you need to be to play 5-a-side and this was the subject of a whole other post (see How Fit Do I Need to Be for 5-a-side). However, to give you an idea, the benchmark for elite level performance, as set by the former head of England’s Futsal programme, is level 12. That’s a great goal to aim for, but most people reading this site aren’t going to be playing at that level, so a couple of notches down from this would still be a respectable result. We recommend that if you’re playing at amateur level you work towards achieving a minimum of level 10. This should allow you to keep pace with the game and not let fitness be a barrier to performing well. Of course if you can push your fitness above this level, you’re going to have an advantage over most players. Firstly, there is more to 5-a-side football than fitness and, although a good level of fitness helps you get to a really good playing standard, there are still good players at recreational level who wouldn’t be able to get a level 10 score. Secondly, most people should be able to improve their score with some training so a level 9 or below is just your cue to do more – we’ve got some tips to help improve your score below. What are the beep test scores of top sportspeople? When the Manchester Futsal players ran the test in 2011 the top score any player recorded over the season was level 13. But scores higher than that have been registered in the past – For example, Brett Emerton, the former British Premier League player capped 94 times for Austraila, earned somewhat legendary status getting a level 15 score just before the 2006 world cup. Confirmed records don’t tend to get beyond level 17 (four levels short of the fantasy stories of Beckham and Armstrong). One of Great Britain’s finest ever distance athletes over 800m and 1500m (he was once a world record holder in both of these distances), Seb Coe took the test. He managed to achieved a highly impressive level 17. For more beep test score results, you can see the summary on Top End Sports. This is a fantastic video showing you exactly how to run the test. It’s also delivered by a guy who is guaranteed to remind you of your fairly serious P.E. teacher. The highlight of the test is seeing one of the participants reach a very impressive level 13 – you’ll see that it’s no easy task. Your score on the beep test can be improved if you know a few simple tips. See our 8 tips to improve your beep test score. Is this the best fitness test for a team sport like 5-a-side? It’s certainly a great test to do to test your aerobic fitness (that’s where your body is using oxygen and you’re exercising over a longer period of time), and it’s in use in a lot of the professional sports teams. However, you cannot neglect your anaerobic fitness which tests your ability to perform shorter bursts required for 5-a-side / Futsal. That’s why the YO YO intermittent recovery test is also now in popular use as it’s considered to be more sport specific to the actions required for 5-a-side. Want to know more about this? Sit tight and subscribe – it’s coming to the site shortly! Beyond these tests, there are a number of other tests that you can do to measure your conditioning for 5-a-side, including sprint speed, leg strength, and flexibility. We’ll bring you more on this too in future weeks. There are a couple of questions that come up again and again for the beep test – here are the most popular but if you think we’ve missed any, add it to the comments below and we’ll make sure it gets answered. Q: Do I have to turn on or past the line? Your foot needs to be on or over the line. Notice that we said ‘foot’, as putting just one foot on or over the line is completely acceptable, something that is to be advised when the pace is fast in the later stages. Q: Am I allowed to miss a beep and still continue? Strictly no. However, many people allow one level to beep before the person makes the line, but if that person does not make the next interval then the most recent level they completed is their final score. This approach allows for the individual to calibrate themselves with the beeps, and only finish the test when their fitness will not permit them to go any further, rather than because of their poor timing. Q: Can I run ahead? Level 1 is very slow – walking pace for most people. You are able to run this if you want but you cannot start the next interval until you hear the beep. This ensures that you step up your pace in line with the audio recording, which is the point of the test, not to go a constant speed and ignore the beeps. Q: How accurate is the beep test? 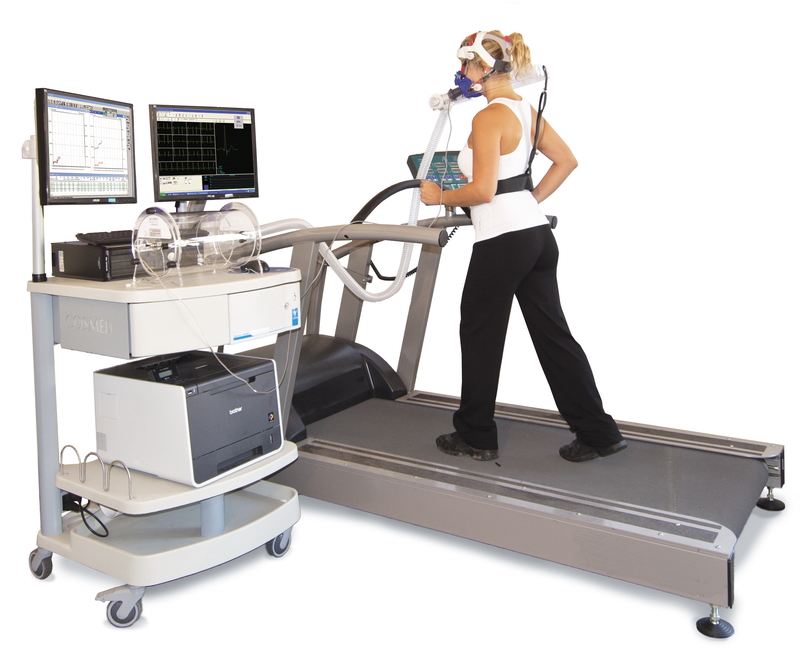 It only provides an approximate measure of VO2 – for an accurate measure a test needs to be done under laboratory conditions. However, for sports it’s useful to use the levels as an absolute indicator of the fitness of an individual. Although it does not take account of ages and body shapes, you know that a level 12 on the beep test will allow anyone to be able to keep up superbly on the 5-a-side court. We’ve put together this free summary sheet for you to download and use as a handy reference point when doing the test. 5-a-side.com does the beep test – Find out how we got on when we took the test. 8 tips to improve your beep test score – simple tips to help you get your max result! Yo-Yo Intermittent Recovery Test – A test which is fast replacing the beep test as the fitness test of choice for soccer. 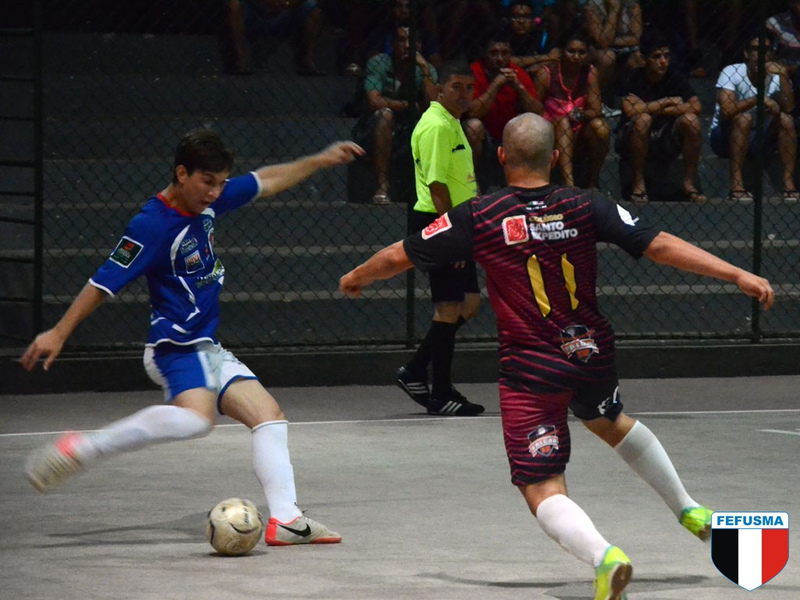 How fit to I need to be for 5-a-side – How did high-level futsal players get on in fitness tests? The physical and mental benefits of 5-a-side – The benefits are massive. Find out exactly what they are in this article. Really good article again Chris and love the give-away. Just wondering – what specific training drills/exercises can you do to improve your beep test score? Thanks Dene. I would say it all depends on your personal situation – if you’re looking to move from a level 6 to 7 then it will need a different approach to someone looking to go from 10 to 12. My preferred way to get fit is just simply to play as much football as possible – it’s got everything to get you fit, plus it’s a lot more interesting than doing drills on your own, or that’s what I find. That said, I’m also really interested to know if high intensity interval training (HIIT) can be used for fitness in general and especially 5-a-side. So if it were me looking to move up a level (as I certainly am), I’d play as much football as I can, supplementing it with a bit of running, swimming and even cycling – whatever is convenient and enjoyable. I think the battle to get fit is twofold – being motivated to do it (and that’s where the enjoyment factor comes in) plus being willing to push yourself because that’s the only way you see significant gains. Wow, that sounds like a whole other blog post right there. Got any tips that work for you? When you’re going for those very high scores there doesn’t seem to be much else apart from hard training. Hope you get there! Hi, I am at level 8 and I want to go to 10. How can I achieve this? Hi Kostas, follow these 8 tips and you should improve. 8 simple tips for the beep test. I must stress: the main way to improve is to get fitter. That article will guide you through the best things to do.